Connecticut Technology Council presents ESPN with its 2010 Innovation Excellence Award and recognizes Secretary of State-Elect Denise Merrill as its Public Policy Leader of the year, and recognizes board members Carol Pride, CIO of Mohegan Sun and Ira Yellen, President & CEO of First Experience Communications as CTC Volunteer(s) of the Year. 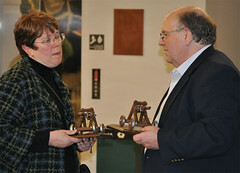 The Connecticut Technology Council (CTC) has presented its 2010 Innovation Excellence Award to member company ESPN. The award was presented at the Council’s Annual Meeting held at the Yale West Campus Thursday evening. Chuck Pagano, Executive Vice President of Technology at ESPN accepted the award on behalf of the company. The Innovation Excellence Award is now in its seventh year and is given to the CTC member which has displayed technology leadership in its industry vertical, grabbed increasing market share, and been recognized for innovation by its peer or trade groups and industry analysts. Chris Kalish, Chairman of the Connecticut Technology Board, and an executive at General Electric and director of the GE Edgelab in Stamford, cited ESPN for its firm commitment to Connecticut and Bristol and to its leadership and dominance in sports broadcasting. Previous year winners have been: ATMI, Inc of Danbury, Pitney Bowes of Stamford, FuelCell Energy of Danbury, Open Solutions Inc of Glastonbury, Sonalysts, Inc of Waterford, and 2009 winner United Technologies Corporation. 2010 Annual Meeting & Holiday Party from Connecticut Technology Council on Vimeo. Receiving the Council’s 2010 Public Policy Leader of the Year Award this year was Denise Merrill, former majority Leader in the House and Secretary of State-Elect. Merrill was instrumental in formulating much of the legislation that became the Jobs Bill that passed in June by the Connecticut legislature and which will result in job creation along a number of fronts, but particularly through initiatives related to providing more risk capital related to start-ups and later stage tech companies. Also honored at the 2010 CTC Annual Meeting were two CTC Board members, Carol Pride, CIO of the Mohegan Sun and Ira Yellen, President and CEO of First Experience Communications. Both were cited for their volunteer efforts in support of the Councils events and marketing programs. The Connecticut Technology Council is the state’s industry association for the technology sector. CTC’s mission is to be “the catalyst for innovation and growth. CTC seeks to identify and connect the entire technology community, works to increase innovation that leads to entrepreneurship and job creation in all size firms and is a strong advocate for specific programs as well as a public understanding of the need for a world class innovation environment in Connecticut. The Council produces many events that help, bring together and recognize achievement from start-ups to the state’s fastest growing companies.